3 defendants have been added to the trial of Maryam Sanda who allegedly stabbed her husband bilyamin bello to death, channels reports. 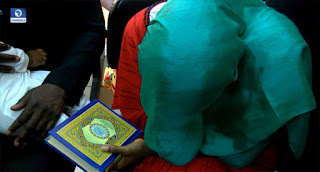 Sanda’s trial took off on Thursday at the Federal High Court Jabi with the police filing an amended charge to include her mother Maimuna Sanda, her brother Aliyu Sanda and one other person. The prosecutor, however, revealed that the police was unable to serve the three defendants. Counsel to Sanda, Hussein Musa, tendered an application for the bail of his client, asking that she be released on interim bail as she is a nursing mother. The state prosecutor, however, kicked against the application asking for it not to be taken since the charge has been amended. The presiding judge, Justice Yusuf Halilu, said the bail application isn’t ripe for hearing and he will not be given bail until all defendants are arraigned in court.